What is a Searchable PDF? A searchable PDF file is a PDF file that includes text that can be searched upon using the standard Adobe Reader “search” functionality. In addition, the text can be selected and copied from the PDF. Generally, PDF files created from Microsoft Office Word and other documents are by their nature searchable as the source document contains text which is replicated in the PDF, but when creating a PDF from a scanned document it only contains images of the text and an OCR process needs to be applied to recognize the characters within the image. Searchable PDF documents are especially useful to access content in documents that must be archived with their precise original appearance. Our online service allows you to make searchable PDFs from scans online for free. The screenshot shows a searchable PDF. The PDF contains the original scanned image plus a separate text layer produced from the OCR process. 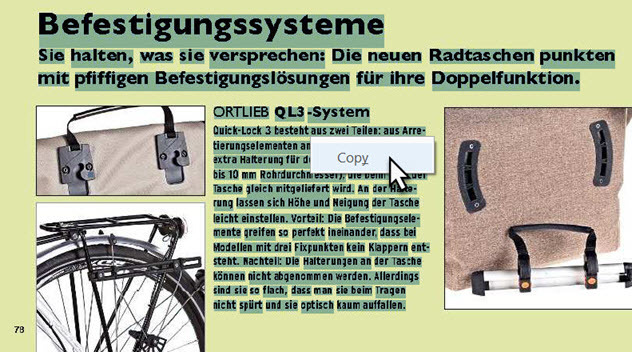 In this example is the text layer defined as invisible, but can still be selected and searched upon. For this reason (two layers, one image, one text), a searchable PDF is sometimes also called sandwich PDF. Very easy: Just select one of the two create searchable PDF options on the front page. You can either choose to have the text layer invisible or as visible overlay. You can also create searchable PDFs directly via our API: In this case the JSON response of the API contains a download link for the the searchable PDF. This download link is valid for one hour, afterwards all data is removed from our OCR servers. isCreateSearchablePdf = true triggers the generation of the searchable PDF. With the free OCR API, the generated PDF contains a little watermark "Generated by OCR.space" in the lower right corner. With the PRO OCR API, no watermark is added to the created PDF. More details are available in the Searchable PDF API section of the OCR API documentation. The free version of the OCR API adds a small watermark at the bottom of each page of the created searchable PDF. The free version is also limited to the first three pages of your input PDF. With the PRO PDF plan, you can convert PDFs of unlimited page size. 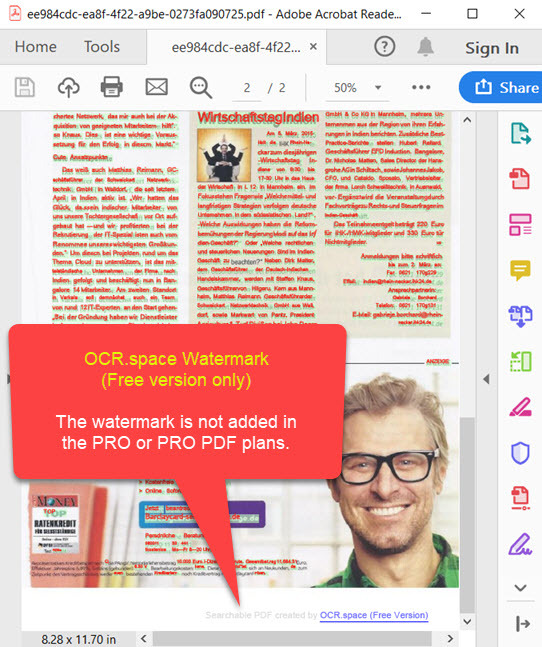 The watermark is not added if you use the PRO or PRO PDF OCR API plans.